Every day a different body. Every day in love with the same girl. Based on the 2012 New York Times bestselling novel of the same name, written by David Levithan — though adapted for the screen by prize-winning novelist/ screenwriter Jesse Andrews, who penned the script for his own book, Me and Earl and the Dying Girl, when it was made into a feature back in 2015 — Every Day tells the story of ‘A,’ a genderless, disembodied entity who wakes up involuntarily occupying a different a body each and every day — be it male or female, light or dark-skinned, straight or gay — these hosts all round about ‘A’s’ age (which is sixteen) and living in the same vicinity. Replacing their consciousness with that of its own, ‘A’ lives a full day as each of these people, the nameless spirit — who has individual thoughts, feelings and memories — able to access the psyche of the person whose body they are currently inhabiting, which makes getting through the day (hiccup free) a helluva lot easier. Jumping from one identity to the next, ‘A’ has never resided in the same shell twice, having grown up and aged (from birth until now) dwelling inside others approximately its own age. Sounds like a lonely way to live if you ask me. 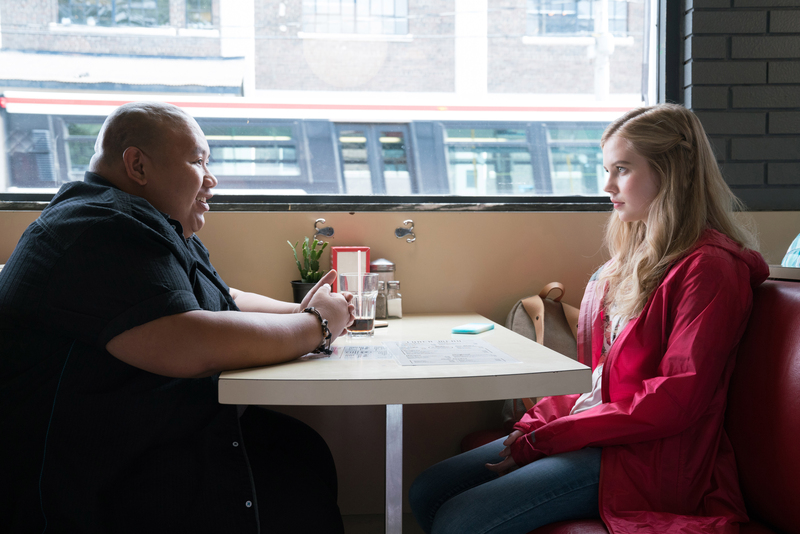 Anyhow, the movie opens when ‘A’ rises as a boy named Justin (Justice Smith), a high-school slacker with a smoking problem, who happens to be the neglectful boyfriend of Rhiannon (Angourie Rice), a sweet yet insecure girl who, though wise beyond her years, has accepted her not-so-perfect life. On this particular morning, Rhiannon sways Justin (who’s actually ‘A’) into skipping school, the two spending a dreamy day together at the beach. It’s on this outing that Rhiannon opens up to Justin, telling him about her troubled home life, stemming from her dad’s mental breakdown, which almost cost her family everything. By sundown the pair’s relationship feels renewed as Rhiannon is convinced that Justin has changed into a more kind and thoughtful person. Having never felt such a connection with anyone before, ‘A’ starts to fall for the effervescent teen. The very next morning, Rhiannon discovers that Justin has reverted back to his former careless self, having no recollection of that perfect day they’d spent together previously. All the while, waking up in the body of Amy (Jeni Ross), ‘A’ decides to pose as an exchange student at Rhiannon’s school in the hope of gaining her friendship and trust, the travelling soul trying to figure out a way to best approach Rhiannon, then somehow explain its unique phenomenon to her. Very much in love with the girl, ‘A’ wants to convince Rhiannon that that magical day they’d shared was not between her and Justin, but rather between her and ‘it,’ even though ‘A’ realizes that retaining a fruitful and loving relationship with the warm-hearted teen would be virtually impossible, because how can somebody be with a someone who is literally a different person new each day? Commendably helmed by director by Michael Sucsy, The Vow (2012), Every Day brings literal meaning to the phrase ‘spend a day in someone else’s shoes,’ the film packing a powerful emotional punch. There’s so much to praise in the narrative, whose messages feel relevant and timely, the fantastical young adult drama commenting on gender identity, mental health and the importance of empathy, ‘A’s’ journey beautifully interweaving themes of love and longing while also exploring what it means to be human — there’s also some anti-smoking stuff thrown in for good measure. Furthermore, Andrews’ screenplay mostly manages to stay grounded and fresh, despite some lapses in logic (when you stop to think about it, a lot of the fantasy doesn’t make sense), proceedings modernized, too — ‘A,’ for instance, keeps an Instagram account (instead of an email) to communicate with Rhiannon, using the photo-sharing social networking service as a way to document its strange life. Be that as it may, Every Day does slightly falter, the picture let down by some questionable plot developments and an iffy third-act revelation that’s not entirely explored or explained, this left-field ‘twist’ undoing some of the framework set out prior. If you haven’t yet seen the movie I suggest you skip the next few paragraphs, as you’re now entering spoiler lane. You see, up until this point ‘A’ has lived life abiding by some simple guidelines, the most vital being not to screw up the lives of the host bodies during its stopover, as meddling in the affairs of others could, ultimately, reshape their entire reality. This is made obvious from the get-go, Rhiannon initially taken aback (and rightfully so) when learning that she’d been manipulated by ‘A’ (as Justin), having been smooched by, and disclosing long-buried secrets to, well, a stranger. So, having witnessed Rhiannon’s anger first-hand, it becomes a tad puzzling when ‘A’ decides to interfere in the life of another, a girl who’s literally calendared her own suicide, the narrative breaking the ‘24-hour stay’ theory by having ‘A’ ‘push back’ and hang about in the body for another day to cease the self-harm. With the rules now changed, ‘A’ chooses to rest in another host for a number of days, a shy fellow classmate of Rhiannon’s named Alexander (Owen Teague), (theoretically) making a long-lasting relationship with Rhiannon possible. The problem here is that the movie now becomes a morality/ ethical tale as ‘A’s’ existence is no longer random/ chance, the narrative unnecissarily introducing a whole lot of superfluous questions, most of which are left unanswered: i.e. why didn’t or hadn’t ‘A’ ‘pushed back’ earlier? Moreover, the choice to remain in someone’s shell rubs against the compassionate and considerate character ‘A’ is set up to be, this coming off as self-seeking as opposed to selfless or loving. With that said, Every Day is still admirably ambitious, the film more-or-less achieving what it sets out to do. Those that’ve read the book will no doubt notice that roles of certain characters have either been lessened or altered. First up there’s Nathan Daldry (Lucas Jade Zumann), a reserved religious boy who, after being taken over by ‘A,’ tries to convince others that it was Satan inside of him, this fascinating story-thread introduced then immediately tossed aside, which makes me wonder why it was included in the first place. And then there’s Father Poole (Martin Roach), who kinda-sorta worked as the novel’s antagonist, the guy only given one brief scene. The perspective has also been changed from that of the paperback, which is told entirely through ‘A’s’ eyes, the heart of the story, though, remaining pretty much intact, its lessons still clear and transparent. Made up of eager young stars, the cast is great. Australia’s Angourie Rice, The Nice Guys (2016), shines as Rhiannon, a vibrant tuned-in teenager trying to figure out whom she is and how to define herself, her friendship with ‘A’ giving her a new outlook on life and a better understanding of the world around her, the relatively untested Rice proving her worth as a Hollywood headliner. Given that a physical body doesn’t define our protagonist, the fifteen actors-slash-actresses who embody ‘A’ do an excellent job in keeping the character consistent, the transition between performers seamless. Justice Smith, Paper Towns (2015), in particular, wows, the talented up-and-comer going from lazy and irritable as Justin to gentle and sensitive as ‘A,’ wholly selling both parts. Of the remaining ‘As,’ Jacob Batalon, Spider-Man: Homecoming (2017), stands out as James, a tubby black ‘A,’ while newbie Owen Teague charms as wallflower Alexander, who winds up being a pivotal player by the film’s conclusion, his gentle portrayal of ‘A’ making it easy to understand why Rhiannon could ever fall for the ghostly drifter. Elsewhere, Debby Ryan, Life of the Party (2018), brings some sass to the screen as Jolene, Rhiannon’s spunky big sister, who’s a bit more cheeky and independent, whereas Maria Bello, Coyote Ugly (2000), is totally wasted as the girls’ mother Lindsey, the 51-year-old given a paltry part with a mere number of scenes. Seven billion smiles, and yours is my favorite. Ultimately, it’s the deep, creative metaphors and thought-provoking concept that make Every Day a solid way to spend 100 or so minutes, even if it does fall victim to many of the hallmarks synonymous with schmaltzy teen weepies. It helps that the flick is nicely shot and features an enchanting, upbeat soundtrack, the post-punk ’80s hit ‘This is the Day,’ performed by The The, getting multiple spins for storytelling purposes. Faults and plot holes aside, Every Day is a movie with its heart in the right place, reminding the narcissistic ‘Me Generation’ that appearances (be it gender, physique or race) don’t really matter when affairs of the heart are concerned.